Veneers and laminates are one of the most sought-after treatments in all of cosmetic dentistry. Their application involves replacing a part of the natural enamel with porcelain in order to improve the appearance of the smile. At Celebration Family Dental, we can use them to completely transform your smile and confidence at the same time. Veneers are ultra-thin tooth covers that are placed on the fronts of the teeth; they’re designed to disguise a range of aesthetic flaws. They’re typically made out of porcelain, which mimics the appearance of natural tooth enamel so closely that onlookers cannot even tell the difference. Traditional veneers require us to remove a significant amount of the natural tooth structure so the final result of the procedure does not look bulky or unnatural. Therefore, this is a permanent procedure. There is no reason to be afraid of making the commitment, however; the vast majority of people who receive traditional porcelain veneers are extremely happy with their results. Various brands use special formulas to create porcelain restorations that are durable despite being quite thin — even thinner than their traditional counterparts. Therefore, as their name implies, minimal-prep veneers require less tooth modification. They can produce stunning results and be quite durable. Your journey begins with a cosmetic consultation, wherein we’ll make sure that your teeth are healthy enough to support veneers. We’ll also answer any questions you may have about the treatment. If you decide that veneers are right for you, we’ll prepare your teeth by removing as much enamel as necessary to make your new smile look natural and stunning. Sometimes, we use local anesthetic to make sure our patients comfortable during the prep process. Then, we’ll take detailed images and impressions of your teeth. A dental lab will use that data to fabricate your permanent veneers. In the meantime, you may need to wear temporary veneers to shield your teeth from food and beverages. 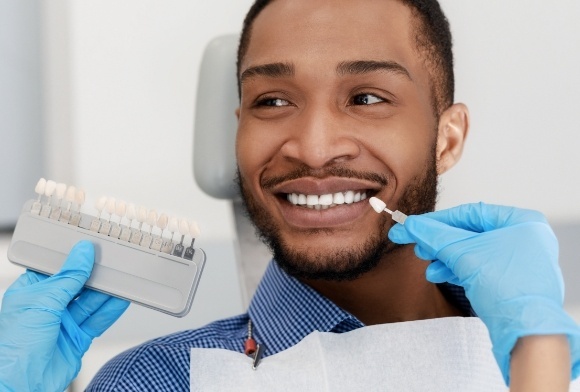 When your permanent restorations arrive in our office, we’ll double-check to make sure they’re a perfect match for your smile. We may have to make a few minor modifications to them. Then, we’ll attach them to your teeth so you can enjoy the stunning, Hollywood-ready grin that you’ve always wanted. A set of veneers can last for 10 years or longer with proper care. Caring for veneers is easy. You’ll be able to brush and floss like normal. However, you should remember to use a low-abrasive or non-abrasive toothpaste to avoid scratching the porcelain. 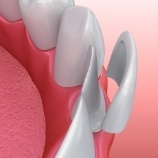 Veneers don’t decay, so they can protect the fronts of your teeth from forming new cavities. Some people have the misconception that porcelain veneers will make their teeth appear unnaturally white and large. That is not the case at all! Thanks to us, your porcelain veneers will be barely noticeable and made to match the natural color of your teeth. Porcelain reflects light just like natural enamel, and the shells are so thin that they blend well with the rest of your teeth. The result is an enhanced, yet natural-looking smile which boosts your confidence and overall appearance at the same time. The procedure of placing veneers begins with an examination so that the appropriate shade of porcelain can be determined. We will create impressions of your teeth and send them to a dental laboratory to create your restorations. The teeth will also need to be prepared by buffing off a small amount of enamel before applying the veneers. 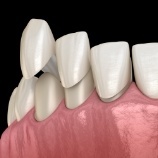 Once they are completed, your custom veneers will be bonded to your teeth to give you a brand new smile. The procedure is easy and painless. If you’re ready to see a perfect smile in the mirror every day, porcelain veneers can help you do exactly that. To get them, contact us today.